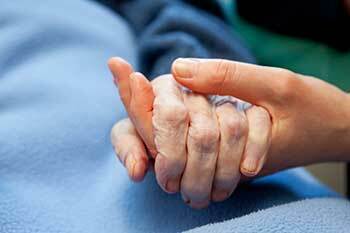 Why do nursing homes describe pressure sores according to ‘stages’? Nursing homes and hospitals use a four stage scale to describe, monitor and treat pressure sores (also called bed sores, pressure ulcers or decubitus ulcers). By categorizing pressure sores, according to standardized characteristics, a sense of uniformity can be established amongst all medical facilities that treat people with pressure sores. Bed sores are categorized based on their severity (stage 1, stage 2, stage 3 or stage 4). The National Pressure Ulcer Advisory Panel, a professional organization dedicated to the prevention and treatment of bed sores, has set forth specific characteristics to help medical professionals objectively categorize a wound. 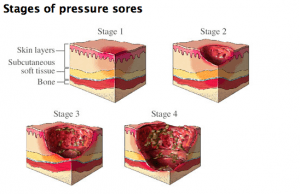 Stage I– Initially, a pressure sore appears as a persistent area of red skin that may itch or hurt and feel warm and spongy or firm to the touch. In blacks, Hispanics and other people with darker skin, the mark may appear to have a blue or purple cast, or look flaky or ashen. Stage I wounds are superficial and go away shortly after the pressure is relieved. Stage II– At this point, some skin loss has already occurred — either in the epidermis, the outermost layer of skin, in the dermis, the skin’s deeper layer, or in both. The wound is now an open sore that looks like a blister or an abrasion, and the surrounding tissues may show red or purple discoloration. If treated promptly, stage II sores usually heal fairly quickly. Stage III– By the time a pressure ulcer reaches this stage, it has extended through all the skin layers down to the muscle, damaging or destroying the affected tissue and creating a deep, crater-like wound. Stage IV– In the most serious and advanced stage, a large-scale loss of skin occurs, along with damage to muscle, bone, and even supporting structures such as tendons and joints. Stage IV wounds are extremely difficult to heal and can lead to lethal infections. Occasionally, a bed sore may be categorized as ‘unstageable‘. Unstageable bed sores are usually referred to as an extremely advanced wound where there is involvement of skin, muscle and bone. Immobile patients in nursing homes, hospitals, and other medical facilities are particularly at risk for developing bed sores. If you use a wheelchair, you’re most likely to develop a pressure sore on: your tailbone or buttocks, shoulder blades and spine. Although less common, long-term use of a wheelchair can result in bed sores on the backs of your arms and legs where they rest against the chair. Bed-bound patients commonly develop pressure sores in the following areas: back or sides of your head, rims of ears, shoulders, hip bones, lower back or tailbone, knees, heels, ankles and toes.